The Millet Gakona GTX Jacket is a protective shell that will keep you warm and dry through even the worst conditions. The Soft Shell Sapporo™ 3L Warm GORE-TEX® is waterproof and breathable while maintaining mobility. A thermal-regulating and moisture-wicking brushed fleece liner will keep you comfortable, and the ergonomic regular fit leaves room for layering when the mercury drops. There is an attached hood to protect your face, and the semirigid visor will stay out of your eyes. The attached powderskirt has a pant-compatible connection system to keep the snow off your back, and zippered pit vents allow you to dump the heat when you work up a sweat setting that boot pack. 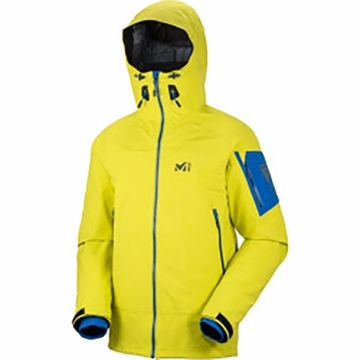 The Millet Gakona GTX Jacket is a versatile, durable shell that will keep you comfortable skiing – in or out of bounds.